Several scientists at The University of Texas Medical Branch (UTMB) collaborated with researchers in Latin American countries to develop a vaccine against the deadly epidemic caused by the Zika virus. Leading research facilities at UTMB in the fight against Zika include the Institute for Human Infections and Immunity and The World Reference Center for Emerging Viruses and Arboviruses. “We are leveraging our size and expertise to understand Zika at its fundamental level and disseminate the best and most timely information to help state, local and federal agencies fight this terrible virus,” said UT System Chancellor William H. McRaven, who launched the Quantum Leaps strategic initiatives last year. 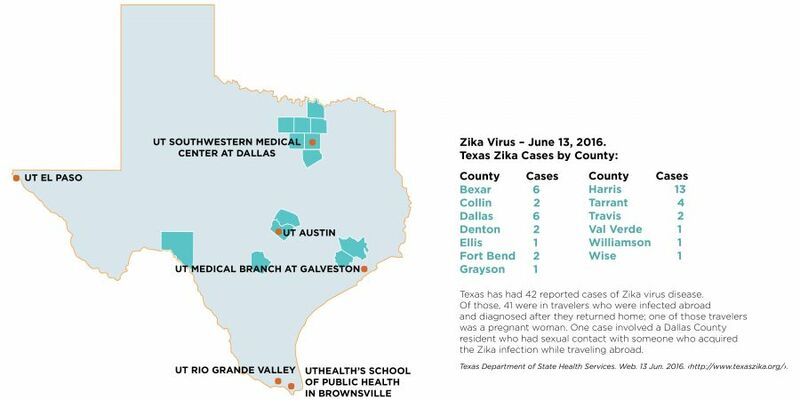 UTMB’s scientists have been leading the research on the Zika virus. In a major breakthrough, UTMB researchers were the first to genetically engineer a clone of the Zika virus strain. This is a fundamental step in understanding Zika virus infection process, and to developing vaccines and treatments. “The new Zika clone represents a major advance toward deciphering why the virus is tied to serious diseases,” said Pei-Yong Shi, Ph.D., a UTMB professor who led the clone study. A second landmark discovery by UT Southwestern scientists showed that Zika virus directly infects brains cells and evades immune system detection. According to UTSW microbiologist John Schoggins, Ph.D., the study’s lead scientist, Zika virus infects brain cells destined to become neurons. 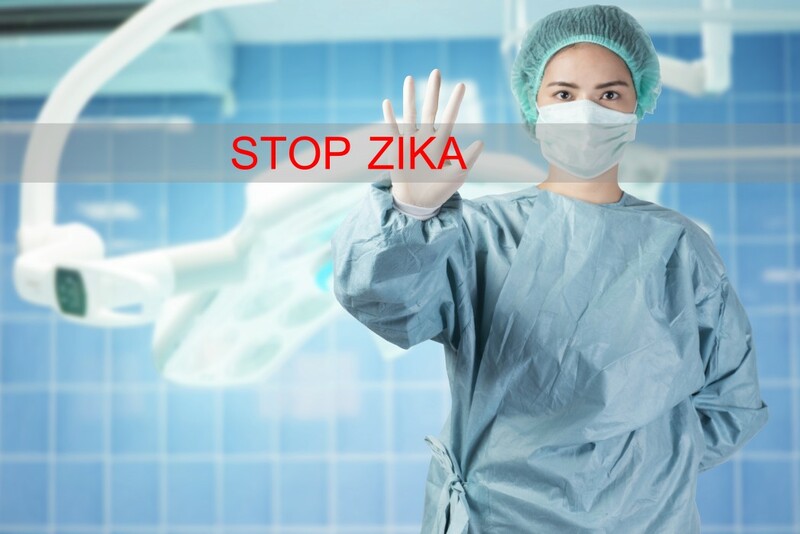 The study, “Western Zika Virus in Human Fetal Neural Progenitors Persists Long Term with Partial Cytopathic and Limited Immunogenic Effects,” was recently published in the journal Cell Reports. The team led by Prof. David Herrin, Ph.D., at UT Austin, is pursuing a strategy to prevent Aedes mosquitoes, which host the Zika virus, from being infected. They are combining algae with a bacterium to attack larvae of Aedes and Culex mosquitos (Culex carries the West Nile virus). In addition, under the leadership of UT Austin molecular biosciences Prof. Andy Ellington, Ph.D., student undergrads from the Freshman Research Initiative are developing a fast and cheap mosquito testing kit. This will allow people to test mosquitoes in their own backyards for Zika, and have the results within 45 minutes. “This is a really quick and efficient way of being able to identify whether or not a mosquito is carrying a virus,” said Nicole Pederson, a biology major. Tracking the spread of Zika virus and mapping mosquito-infested areas are two additional objectives that are being tackled in several projects within the UT research community. Prof. Sahotra Sarkar, Ph.D., is studying and predicting the global spread of Zika in 100 cities. He is studying the prevalence of two Aedes mosquitos species – A. aegypti (known to effectively spread the virus into humans) and A. albopictus (established as a carrier of Zika virus, but current studies are determining if it can also spread this infectious agent). UT Rio Grande Valley biologists Christopher Vitek, Ph.D., and John Thomas, Ph.D., are launching a large initiative to pinpoint the location and density of Aedes mosquitos by locating their eggs. Doug Watts, Ph.D., is tracking A. aegypti to determine if the virus is reaching the El Paso region. “If mosquito control is ever going to work, the number one priority is education. It’ll be a never-ending profession to stay ahead of them,” Watts said.